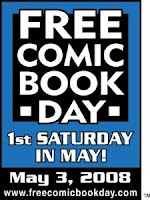 You can already feel the excitement building as we get closer to Saturday and the nationwide celebration of Free Comic Book Day, or FDCB for short. 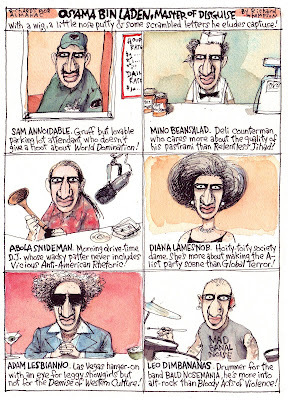 In honor of FBDC '06, I did this Almanack in, um, 2006. Twelve people probably understood it, but in '07 I did another one on BFDC and thirteen people got that one! This year, if I do a DBFC caratoon, I project an even fourteen readers who'll know what I'm talking about. And look, you could've gotten a free Little Neuro comic book, just like Petey reads. And who doesn't want to be like Petey? I'll post the Almanack on DCVII '07 tomorrow. And my thanks to Mike Rhode for pulling this off his wall and out of its frame and scanning it for me. In the post below about Hogan's Alley magazine I mentioned that it can be anagrammed as Holy Lasagne. To my shame, I got that anagram off of a web anagram generator which, once I typed in "hogans alley", coughed up almost 400 anagrams. I'd never used an anagram generator before, being staunch in my belief that such things should be handmade. But heck, this is a blog, it's not like it's a real job and who has the time to make anagrams for free these days with the price of gas being what it is? But I remembered this cartoon that I did late in 2001. I found that "Osama Bin Laden" is good for anagrams, though nothing else, and made dozens of them all by hand then picked my favorites and gave them aliases. And at the time we seemed to've been searching for Bin Laden very hard so I thought this might be of help. I've put in all my wild garlic and onion bulbs and the yard is looking just the way I thought it would. On an unrelated note, how come nobody sings "I'm a Lonely Little Petunia in an Onion Patch" these days? This Saturday is Free Comic Book Day, that special day when millions of Americans crowd into their favorite comic book store and strip it of merchandise, leaving every spinner rack in the nation empty and forlorn! And here's a special bonus offer from Tom Heintjes, the madcap editor of Hogan's Alley, the nation's premier comic magazine whose name is an anagram for Holy Lasagne. "Send us an e-mail ON THAT DATE with your mailing address, and we’ll send you a FREE issue of Hogan’s Alley! No obligations, no strings attached; the only thing it will cost you is several hours as you enjoy the issue. (This offer is valid for all U.S. residents, whether you’re a current subscriber or not.) Remember the one condition--we must receive your e-mail request on Free Comic Book Day, not the day before or the day after." Tom's email is hoganmag@gmail.com . He's got a two year old daughter, so if you email after 8 p.m. please don't use any exclamation points. This is a coupla years old. It's from a little series where Alice's parents attended back-to-preschool night at Blisshaven Preschool, and her mom found her still awake when they got back. When I redid the series as a daily this part got left out, which was too bad. I like this a lot, the colors are pretty, the acting's good and the situation seems true. What I like about it best is the black background; it was a grey-blue and it looked wrong, so I got mad and inked it all in. And then it looked fine. Alice's parents do have names, they're Madeline and Peter, but somehow I've never mentioned it. The joke here, if there is one, is that Hillary is posing as the front-runner. Haha! This Hillary caricature was also posted some months ago so she make look a little familiar. I think I drew it for fun a coupla years back and I've been waiting for a chance to use it since. 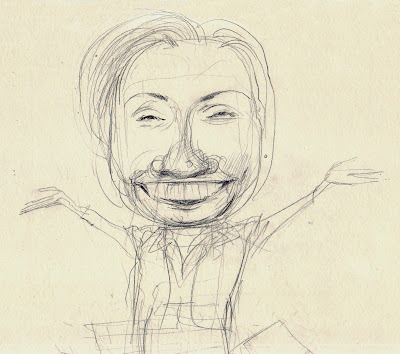 And I did a Hillary finiger puppet joke last October, but I kinda hated the drawing, so this kills two birds with one stone. It actually kills a whole flock of 'em, because the first idea I had was to do something like this with Hillary. This one's from about four years ago during a previous exercise in democracy. It's sort of what's called a "wallpaper gag", one where there's a simple repeating image, though this one varies a little. I've also done this with John Kerry and Al Gore, but this one's my favorite, though despite my best efforts the man got elected anyway. 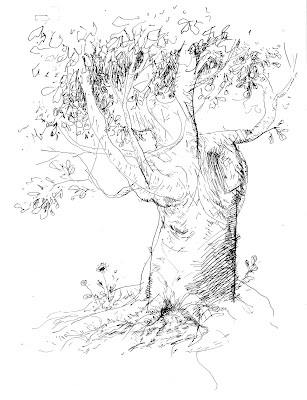 So I just learned that today is Arbor Day in the state of Virginia. I mean, Commonwealth of Virginia. This is an old drawing I like a lot, and I keep trying to turn it into something bigger, like a watercolor painting, but it's hard to translate something so loose into something more thought-out. Like usual, the stuff where I'm not thinking works best. This is from the Post Mag of a few years ago. I redid it for syndication too, but the watercolor version's prettier. It's poignant, I guess. But I'd really like to know what the cat joke is. April 23rd is Shakespeare's Birthday, and I'm celebrating by drinking lots of orange juice. My wife volunteers as a docent at the Folger Shakespeare Library and on Sunday they're doing their annual birthday party (there'll be cake for everybody so y'all come on down). One of the things they need for a children's craft project is orange juice can lids, lots and lots of them. I think they make jewelry or badges out of them. So we're pitching in and drinking frozen orange juice. or really I am, because nobody else here drinks orange juice (Sunny D doesn't count). My wife also runs the fifth grade Shakespeare program at my daughter's school. This year they're doing Richard III, or at least a forty minute version of it, with a big fight at the end, and the kids got to learn stage combat from a real stage combat specialist. So my house is full of wooden sword parts, handmade wooden-tray shields, costumes and orange juice can lids. And I'm full of vitamin C.
It's Sky Awareness Week too. What I'm mostly aware of is how much rain the sky is currently dumping on me. Here are some thoughtful cards you can give the Earth today. She didn't know she'd been. This is from the Washington City Paper, the Paper of Record in this town (even if they did drop most of their comics and Rob Ullman's excellent illustrations, what were they thinking?). If you see it in the Washington City Paper it's so, like Virginia O'Hanlon's father said about the New York Sun. And thank you, Mark Athatakis, from this now officially designated Local Institution. And congratulations to Mike Rhode whose blog, Comics DC, won for (Comic) Art Blog. This was done for last week's New Yorker. Reading left to right; Wright, Douglass, King, X and Obama. I don't usually enjoy "crowd scenes" but I liked drawing this. Frederick Douglass alone is one of the great faces in history and I'd like to draw him again, and larger. Here's a piece of phony Comics History, presented to you a few days early so you can plan how best to ignore it. 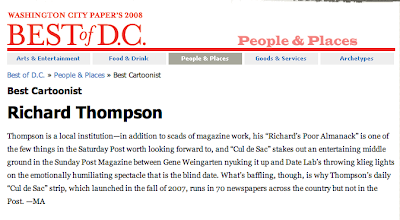 Back in 2000 the Post ran a daily feature called The Century in the Post, reprinting whatever article was most interesting for that day from the last hundred years, duh. And the feature looked a lot like this parody, except it wasn't hand-lettered and it wasn't made up. I'll come clean and admit that I don't know when Dagwood first took a nap on his sofa, but I'll guess that I chose the date August 18th because I couldn't think of anything else to draw for that week. My younger daughter, who goes everywhere, went to a Nationals game today in their new stadium, the first in our family to make it there. We've all been to 6 or 7 games in the old RFK stadium and I'm looking forward to trying out the new place. I'm not a big sports fan, but sitting in the bleachers with a beer & a hot dog and trying to pay attention to what's happening on the field is one of my ideas of a good time. The first few games we attended I kept trying to explain the game and the stats, but kept hitting a wall of ignorance, especially with the stats. So we just watched and cheered whenever the Nats did something obviously good. And stretched in the seventh inning. This was drawn for a special all-Nationals edition of the Post Magazine back in aught-five. Dad is explaining things to Alice, with probably the same level of competence that I did. But it looks like they're enjoying themselves. And, if you look closely, you'll notice they stretch in the seventh inning. The new, improved and relocated Newseum had its official opening this week, hence the above cartoon, which I thought of early in the week then put off drawing till two hours before it was due. On Friday the Newseum offered free admissioin, but as an adult ticket usually costs $20 I'm not sure how soon I'll visitor how often. 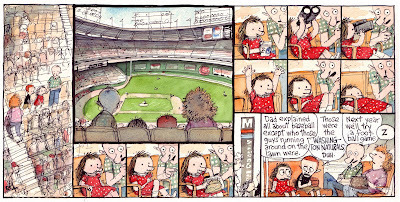 When it was in Rosslyn VA, right across the river from Georgetown, I got there three or four times, but it was free then. The new Newseum sure looks nice from the outside, but it seems a little overbearing and grandiose and I mostly agree with Jack Shafer of Slate.com who wrote a very funny piece on it a few months back. And the Newseum bills itself as the world's most interactive museum and I don't know about you but, being standoffish and lazy I don't really like things too interactive. If it's just pushing buttons to make the little lights in the map light up or the millwheel in the little model gristmill spin that's one thing, I love stuff like that and the old American History Museum always had lots of it. But the Newseum seems to demand a much more intense level of commitment, plus it's all in hi-def 4-D which for me gets creepy real fast. And the way things are going, someday real soon the Newseum'll have on exhibit the Last Edtion of The American Daily Newspaper, taxidermied and displayed in a helium-filled case, with low lighting to preserve it from fading and a sign saying No Flash Photography. And a button to push so the pages will turn. 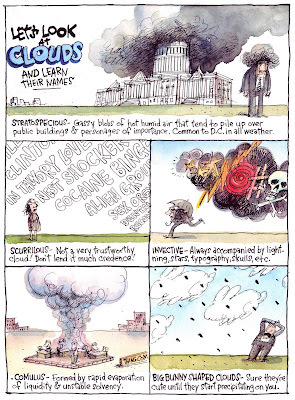 Maybe I'll revise my opinion of it if I actually go see the Newseum, and if they ever install a Hall of My Cartoons I'll deny ever having doubts about the place. I got a very nice email today from Diego Ceresa, the translator who's doing a beautiful job of making Cul de Sac comprehensible in Italian so it can appear in the comic magazine Linus. I've wished for years that I'd learned Italian at some point as it's the language of Art, Music and Food, and it sounds like fun to speak. As it is, the only Italian I know is that provided by babelfish.altavista.com, where I just typed in "cul de sac" and got it translated into Italian as "cul de sac". So it's universal, which is a relief. "Bottom of the bag", the literal English translation of "cul de sac", translates as "parte inferiore de sacchetto", which sounds delicious and reminds me it's lunchtime. Ho ottenuto oggi un email molto piacevole da Diego Ceresa, il traduttore che ha fare un lavoro bello di rendere Cul de Sac comprensibile in italiano in modo da può comparire nello scomparto comic Linus. Ho desiderato per gli anni che italiano istruito ad un certo punto poichè è la lingua dell'arte, della musica e dell'alimento e suona come divertimento parlare. Mentre è, gli unici italiani che conosco sono che hanno fornito da babelfish.altavista.com, dove ho scritto appena "in cul de sac" ed ottenuto esso tradotto in italiano come "cul de sac". Così è universale, che è un rilievo. "la parte inferiore del sacchetto", la traduzione in inglese letterale "di cul de sac", traduce come "parte inferiore de sacchetto", che suona squisito e mi ricorda esso è l'ora di pranzo. Grazie di Molto, Diego! sent me this link describing how bad cul-de-sacs are for the environment and for the mental and physical health of those who live on them . Uh-oh. Expect the strip to take a sudden bleak turn. And richly deserved too. I hope you all read his Wash Post Mag story about Joshua Bell busking in the DC Metro. If not, go do it now . And watch the video of Bell in the subway. It's a fascinating piece, and it makes you wonder, what would you do if you were unexpectedly confronted with Beauty, Art & Genius in a wholly unlikely place? Especially if Beauty, Art & Genius was playing for throw money? And my apologies for the above image. 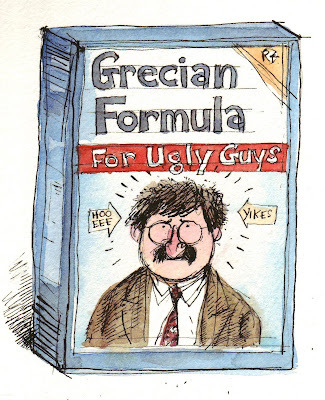 In several years of drawing Gene for his column this is the only one that looked remotely like him. 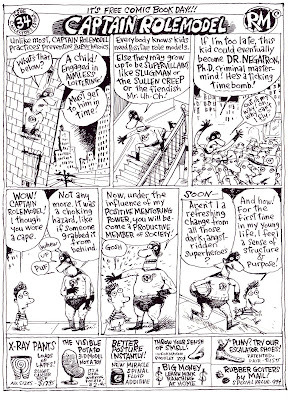 Back in the early 90s, for about 5 years, I illustrated a column by Joel Achenback called Why Things Are that Gene edited (Joel & Gene, along with several others Post staffers, had migrated north from he Miami Herald when that paper took an editorial nose-dive). 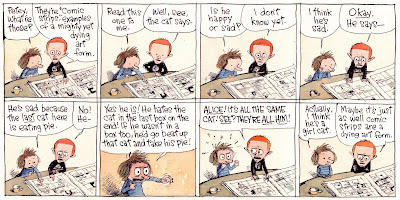 When Joel ended the column Gene asked me if I'd like to try a weekly cartoon, which eventually became Richard's Poor Almanac, and he was my editor for the first few years. So I owe Gene bigtime. And for a while on the side I illustrated Gene's column in the Post Magazine, where I'd often get to draw him and his fabulous mustache. Oops, his birthday was March 31st. Thanks to recent advances in technology I can now offer the latest up-to-the-minute Almanack the same day it appears in the Washington Post. So here's the one for today. As far as I can tell the only real joke is that it's all about comics but there's almost no actual drawing in it. Next time I'll try for no drawing at all, and no jokes either, and sign it "George F. Will" and see if anybody notices. 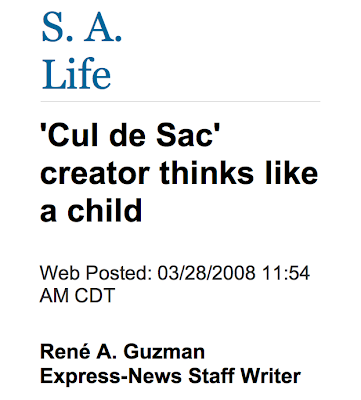 If you read it in the San Antoinio Express-News it must be true ! We're going down to the Tidal Basin tomorrow to see what's left of the cherry blossoms.My wife's aunt & uncle, two of my favorite people, will join us down there, so I hope the blossoms haven't washed away in the rain. When I was a kid we'd go down to the Tidal Basin at night to see the blossoms, and there'd be 3 or 4 military searchlight trucks positioned at intervals around the Basin. They'd sweep across the water, lighting up the blossoms and it was nice to see. I always loved searchlights when I was a kid and whenever we'd see one in the sky I'd want to go find it, which led my obliging parents to take me to a number of car dealerships and store openings. But I remember the lights down at the Basin in particular, and how whatever was used to fuel the flare in its central lamp (magnesium?) would hiss and how you couldnt look directly at it for more than a few seconds. I still like searchlights and whenever I see one in the sky (or several, as everybody uses those synchronized quadruple light gizmos) I get all excited and want to go find them. I'm easily amused. Take a Poet to Lunch! It's true! It's National Poetry Month! Here, something to help you celebrate, and so much better than that lousy CGI movie. It's still Cherry Blossom Time in DC. And look, another cherry blossom cartoon. Did I mention I've got a million of these? Thankfully, it's in black and white instead of some vivid pink that sticks in your retina all day. 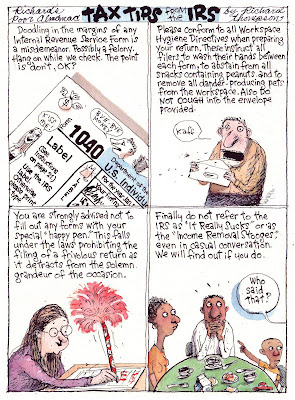 This is the first appearance of Petey, on February 15th 2004, in the second strip published in the Wash Post Magazine. He's changed only slightly; I think I like his hair better here. 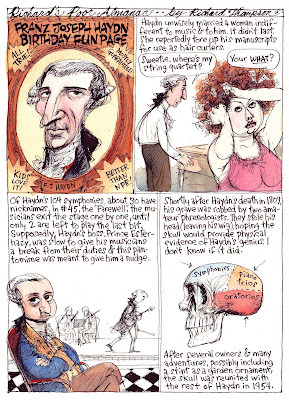 And below this strip is an Almanac cartoon from maybe ten years ago. See? It all fits together. Someday I'll figure out how every drawing I've ever done is a small piece of a larger picture, and my personality will then be so integrated that I'll be issued a certificate of guaranteed sanity by whoever's in charge of such things. Then I won't know what to do with myself. 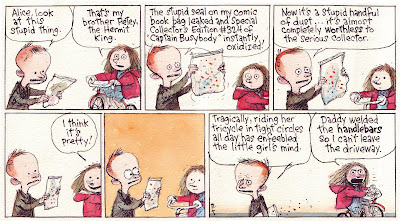 I think the Captain Busybody strip just proves that superheroes are impossible to parody, unless the parody takes the form of Herbie or the Tick.